We start a wonderful new topic on the PaperArtsy blog this week exploring the possibilities within Hybrid Inks. They are a hot new thing in this industry for 2017, with many different hybrid brands available. How do you work out what they are a hybrid of, and how to use their properties to good effect? Well, we are here with our talented bloggers to help you figure that out! Tonight Etusko uses the new Ranger Distress Oxide Inks for a gorgeous leafy effect. 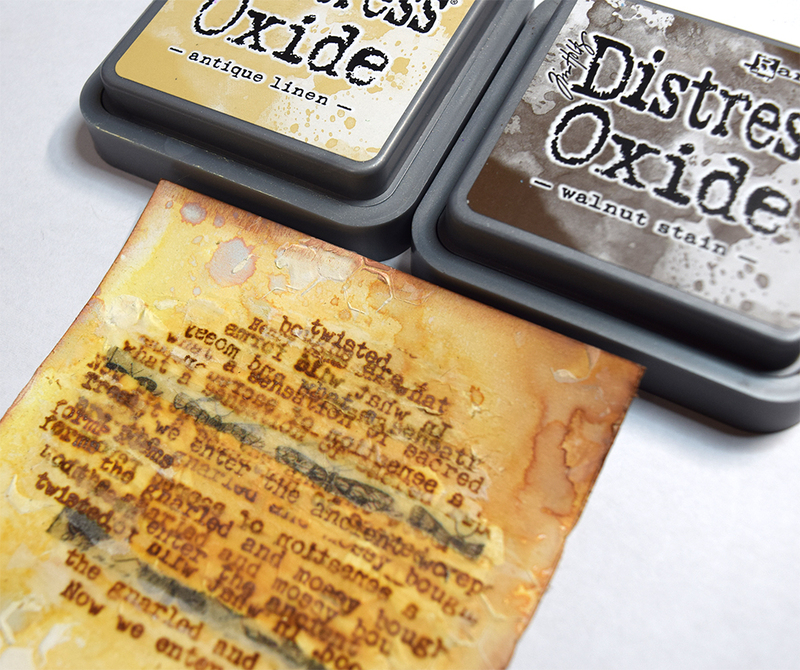 Oxide inks are a unique hybrid of both DYE and PIGMENT inks. They are thick and creamy like a pigment ink, and have a slow dry-time enabling you to achieve awesome blending with direct to paper techniques, stamp crisp images, emboss images. 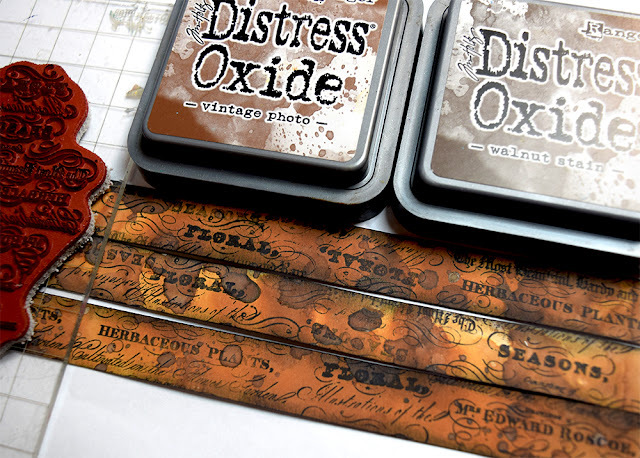 The dye component and 'distress' effect that Ranger have long promoted under Brand Tim Holtz, still allows them to be water-reactive, producing a chalky,oxidised effect when splatted with water. Hello everyone, it's Etsuko with you and it's wonderful to be back here on the PaperArtsy blog tonight. I'd like to share with you the 'Autumn Box' project. This fortnight theme is 'Hybrid' and I decided to use Distress Oxide ink with Raquel's (Scrapcosy) beautiful new release line. First I imagined a vivid colours design but now is the end of August, so I decided to Autumn colours. I was using it with a light brown line with a focus on Distress Oxide new color Antique Linen. And I tried using soldering metal to the focal point. First I prepared 6 x 6 inch shadow box as the body and I cut the Smoothy White Paper of the same size around the box. I applied gesso directly on the box (surface of the wood) and tried using Oxide but I could not get good result. I used ESC05 leaf stamp by white embossing powder and Tim's Wrinkle-Free technique with Oxides on Smoothy White Paper for the box frame. Also I used PS066 stencil with Grunge Paste on the surplus paper. 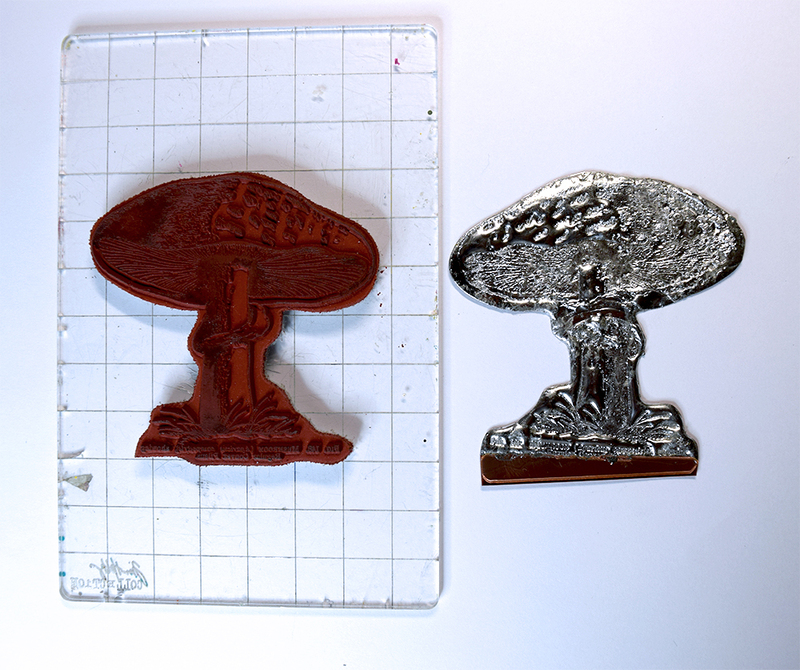 When it dried I stamped ESC04, ESC05 (stockists here) stamps with potting soil archival ink. ...onto tissue paper, and tore it apart then I stuck it randomly on the background. The paper for the edges inside the box. Finally I stamped ESC05 big mushroom on the hot soldering metal and I used some alcohol ink and Treasure Gold Copper and White Gold. Here is a video I made of the soldering technique. I have used a couple of times the technique but it was a fun result. And I stuck all pieces onto the box. 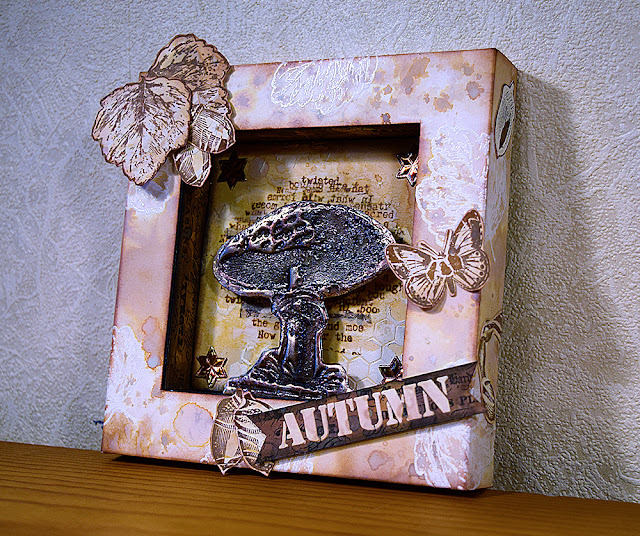 Raquel's new stamps are very beautiful and she has been posting many useful creations on her blog and youtube site. Distress Oxide ink always delivers amazing results and entertains me, the combination of colours will spread the imagination. Why don't you try it? Thank you so much joining me and hope you like it. I look forward to meeting you soon!! Ohhh I'm fascinated by your soldering technique, that looks sooooo amazing! 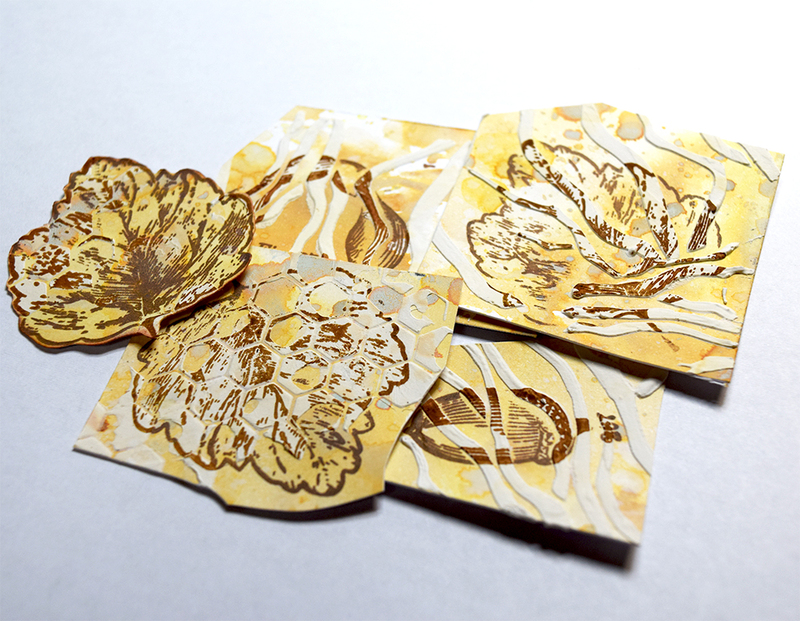 This is a beautiful composition Etsuko, and your oxide ink backgrounds are fabulous! What a wonderful way to start this new Blog Topic! The current topic link Topic 12: Hybrid Inks will close 17:00 (London Time) Sunday, Sept 3rd 2017, and the winner will be announced 2 hours later at 19:00. It's great to see you back, Etsuko; and I love this project! the torn tissue script is a wonderful touch, and I love the colours - definitely think you made a good choice there. Oh Etsuko! 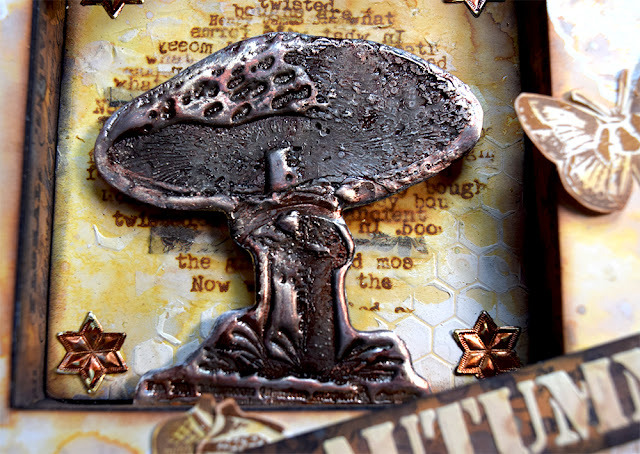 What a wonderful project and brilliant use of the stamped images and the oxides. I haven't bought Antique Linen yet although I have 16 so far! Obviously I need it now I've seen how fabulous it looks here! Fab project Etsuko. 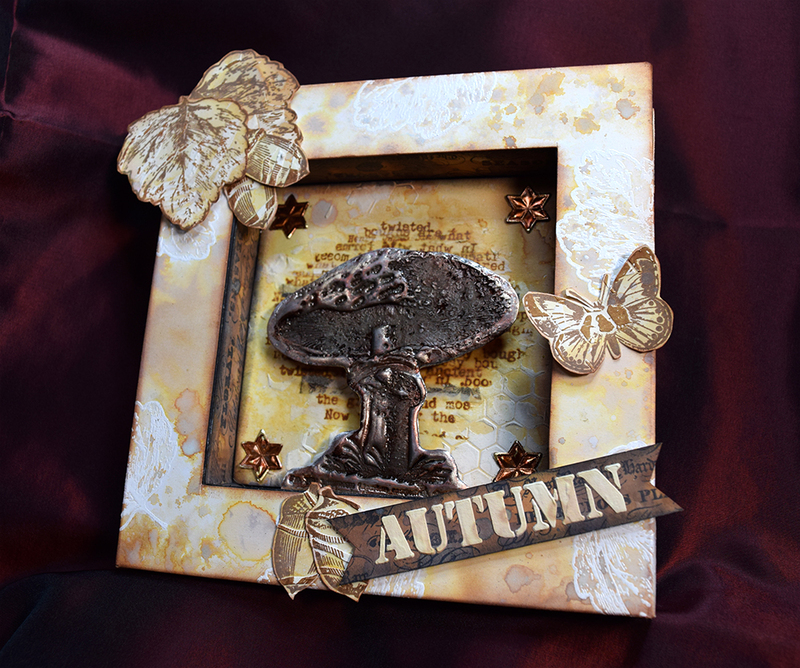 Great colours for Autumn, love the effects of the oxides you have obtained. The script on tissue paper is really effective, must try this technique. Beautiful. I love your color choices. Wow, Etsuko - this is spectacular! The stamping of the mushroom into the solder is breathtaking - I'm absolutely blown away by it - and I love how you used the words to create the background shading around your fungi masterpiece. The inky effects over the white embossed leaves are really pretty, and I love the stamping on the darker inks of the internal walls. I'm altogether in love with this - another wow from me! are they permanent on fabric? What a stunning project and great example of Hybrid inks! Fabulous Etsuko. 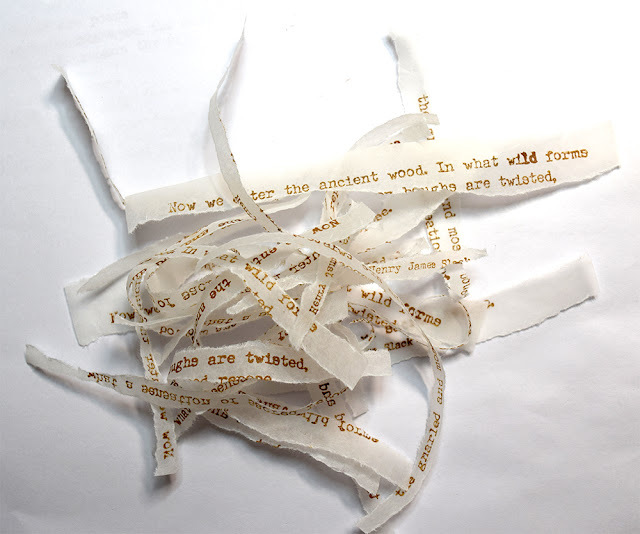 Lovely to see you back on the blog Etsuko and what a beautiful project you have to share. I absolutely love the toadstool stamped into the hot soldering metal. I wish I knew how to do that. 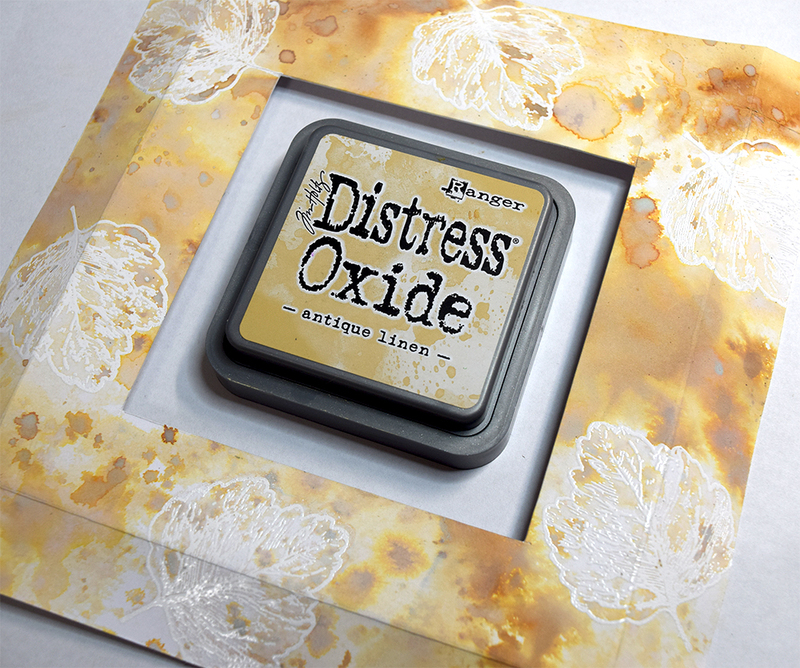 Love your results with the Oxides, they are my favourite ink now and are so versatile. Etsuko, this is absolutely stunning!!! LOVE! I love it! How did you create that mushroom!? We all need to know that technique! And I'm with the ladies, the cut out of the quote in tissue paper looks beautiful, and the stripes inside the frame are gorgeous. I love it all! so many details! Thanks for sharing Etsuko! !